Save up to 50% on assembly time - no special tools or training needed. These attractive and durable Pivot-Lock buildings are the ideal addition to your office space. 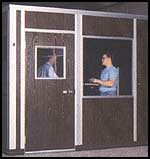 Ideal for office expansion in the plant or warehouse. All panels are completely framed in anodized aluminum extrusions. Wall sections are ready to install upon arrival. Extruded aluminum edges pivot and lock together for quick and easy installation.